Direct Sales Reps, fear no more! 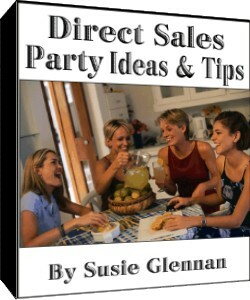 Do you have trouble making sales at parties? Are you lacking the confidence you need to go out there and grab what’s yours? Are you unsure of what to do once you’ve booked a party? Direct Sales Party Tips & Ideas© for Successful Presentations will give you brilliant ideas and tips for how to have fun at any direct sales party. Get the UPDATED version HERE! Side Note: Direct Sales Party Tips & Ideas© for Successful Presentations (now How to Take Charge and Succeed with Direct Sales Parties) is registered with the copyright office. No portion of this eBook may be reproduced or redistributed without prior written permission from The Busy Woman. All key phrases are also under copyright protection and may not be reproduced.